I can’t remember the last time I read a book from start to finish. Perhaps a holiday book; more likely when I was much younger and had the time to wallow in the wordsmith’s creation. Book readers may recognise that detachment from the here and now, as you transport yourself completely to the pages. Reading cover to cover in one evening, uninterrupted by family, is a luxury. The book I have just read is not a luxurious book; at times it is joyful and any parent would identify with family moments of joy and melt-down. But the book provides some serious messages about how individuals are treated by systems and indeed our own roles working within these systems. It is a shocking, local and recent Death by Indifference. Over the past few years we’ve sadly become accustomed by campaigns for justice; Stephen Lawrence, the Hillsborough 96 and most recently victims of Grenfell Tower. All of these have one thing in common, the requirement for extraordinary people to fight for their voices to be heard, to provide evidence that a public system has ignored them, mis-treated them, or mis-represented them. Yet the people involved in these battles are not extraordnary at all, they are as ordinary as you or me, but they have had to find new ways of coping, learn new languages of legal speak and understand processes that they didn’t even know existed. Dr Sara Ryan is another ordinary-extraordinary person. 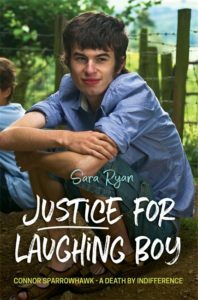 Justice for Laughing Boy is part love story about a much-loved son, brother and friend, Connor Sparrowhawk, and part seering indictment of our health and social care system. It’s all the more powerful because of this juxta-position. At times, you feel part of the family as they career off on another fantastic adventure; the chaos of family life that we can all identify with. At others, it grips your heart with a cold hand and gives it a hard squeeze. I don’t know the family, or indeed many of the key players in the book, personally, but in recognising names and places, the book has an unnerving closeness. This happened in our local area, within a system that we are part of. How can something like this happen in the 21st Century? There is a well-recognised reaction of organisations when attacked. They close up and act as one organism – corporate loyalty. We see it in our own families sometimes, or in our friendship groups. All for one and one for all. Southern Health NHS Foundation Trust closed ranks and forgot what they they were there for, but in the process used public money to distract and fog the pursuit of Dr Ryan to find the truth of what happened on 4 July 2013 and in the days leading up to Connor’s death. In that pusuit Dr Ryan uncovered systemic rot through the organisation, which has had wide-reaching implications for past, present and future people with a learning disability and autism who use NHS services. That Dr Ryan has had the strength and time to write this book is a small miracle. Perhaps it has been a cathartic process to capture the emotions and lay bare the Kafka land she has been walking these last few years. For those of us who followed the unfolding struggle through social media and mainstream reporting, it gives a further insight into the sheer scale of challenge that the family have battled with. May be at some stage, they will be allowed to be a family again and just grieve in their own time on their own terms.